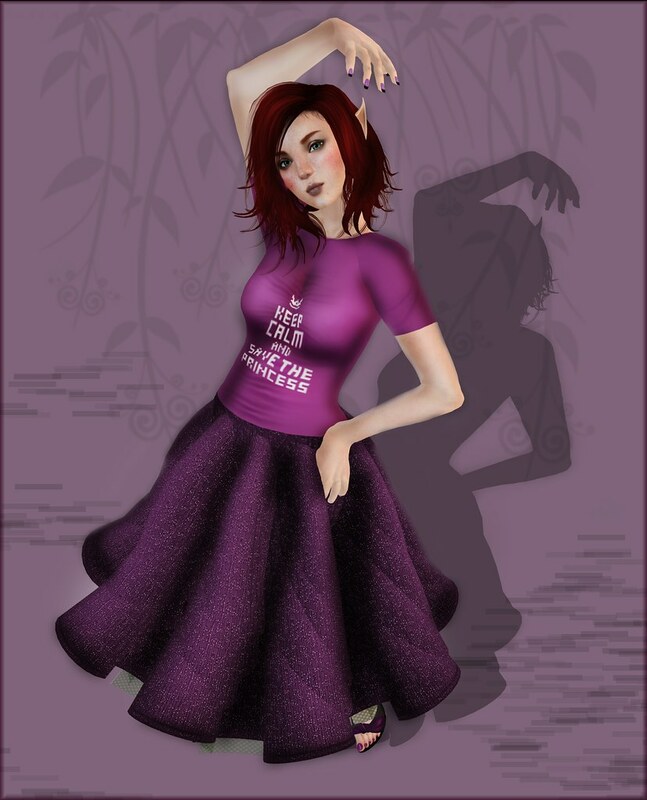 Week 8 of Luna Jubilee's 52 Weeks of Color - Part Deux blogger challenge was Dark Raspberry. I prefer blue raspberry, myself, and in a fit of minor synesthesia started to worry that Dark Raspberry was probably too rich and sweet for my tastes, I'd probably have to dilute it. Then I remembered I wasn't eating the stuff, and everything was okay. It's a common problem when you're me. Forgetting you're not meant to be eating something. Anyway, being British, I'm quite quite over all of the everything exhorting me to "Keep Calm and Carry On". I already WAS, poster! Don't tell me what to do, shirt! You don't know me, mug! And then in a dramatic act of defiance, I explode in panic. It's really quite messy, but there it is. I'm also similarly over parodies of said slogan, which were mildly amusing the first time I saw them but now cause me a certain amount of eye-rolling and unconscious mutterings of "cha, I'm liek, sooo over that" because of how like, totally over that I am, and whatever, and such. Happily, I'm willing to make an exception for this awesome shirt from Witches & Rats, which made me all delighted and smiling when I saw it and I was all like "snag". The 8-bit fontage pulls the whole thing together nicely, and the sentiment is perfect for someone who has Birabuto Kingdom as their ringtone. But you know, the beauty of it is, it can apply to ANY princess! Peach or Buttercup or Garnet or any other princess whose name could be a colour in this challenge. Or like, Zelda. Whatever floats your boat. The skirt here is an oldie but awesomeieieie from Elate, from the Annalisa dress. Really it's one of my favourite skirts ever, even in this age of mesh and all the technological goodies, this skirt is a marvel of prim engineering. It's made from layers and layers of semi-rigid flexi prims, not a sculpt in sight, so that it hold its shape even if you're dancing (I have a wonderful old photo of the impromptu dance party we had in her store when Kellie first released the dress) but still has life and movement worthy of such a sparkly, net-petticoated marvel. Alas for you, the dress is now retired, but you can get a free copy of it in "Night" from FabFree's HQ, if you want to pay homage to the awesome construction for yourself. For the record, I do have legs, I didn't just decide to go stunty for this post, the awkward photo angle arises from the fact that I wanted to show off just a little of these glorious Mesh Boudoir Mules by Lassitude&Ennui. I nearly, NEARLY made it out of my first visit to Festival of Sin without having spent a large pile of money, and then I saw these and had to Fatpack. HAD TO. There was no other way. So here, have a peepfoot, and go get some yourself.